Colorado has substantial conventional fossil fuel resources in the Sand Walsh, Piceance, Paradox, and San Juan basins in the west, and the Denver and Raton basins in the east. It ranks seventh among the states in total energy production, ninth in oil production, fifth in natural gas production, and eleventh in coal production. Colorado has enormous potential oil production through its deposits of oil shale rock, which can be processed and converted into refined petroleum products. The Green River Formation, a group of basins in Colorado, Wyoming, and Utah, holds the largest known oil shale deposits in the world, holding about 1 trillion barrels of oil shale. Colorado has moderately affordable electricity with average retail prices lower than the national average. 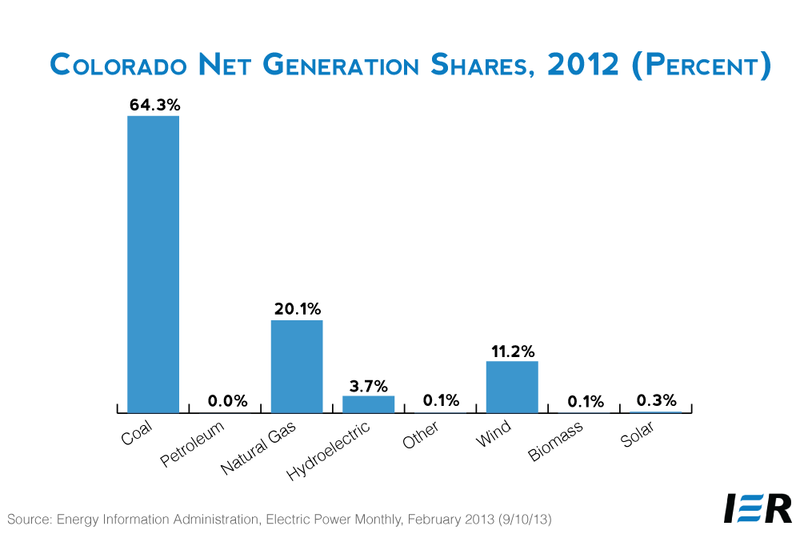 Over 60 percent of Colorado’s electricity is generated by coal and about 20 percent is generated by natural gas. Hydroelectric and wind power combined account for almost 15 percent of the state’s electricity generation. Major rivers flowing from the Rocky Mountains offer hydroelectric power resources. The transportation and industrial sectors are the leading energy-consuming sectors in the state. In 2011, Colorado ranked 7th among the states in total energy production, producing 2,747 trillion Btu of energy. 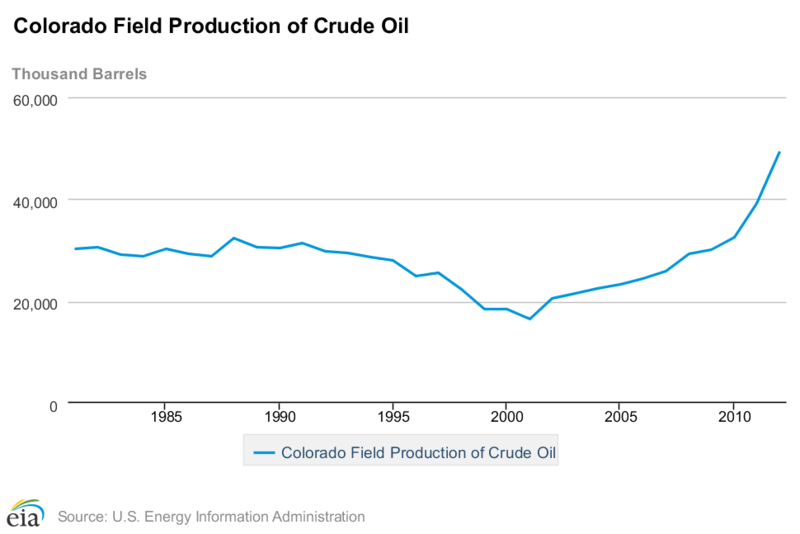 In May, 2013, Colorado ranked 9th in oil production, producing 4,883 thousand barrels. 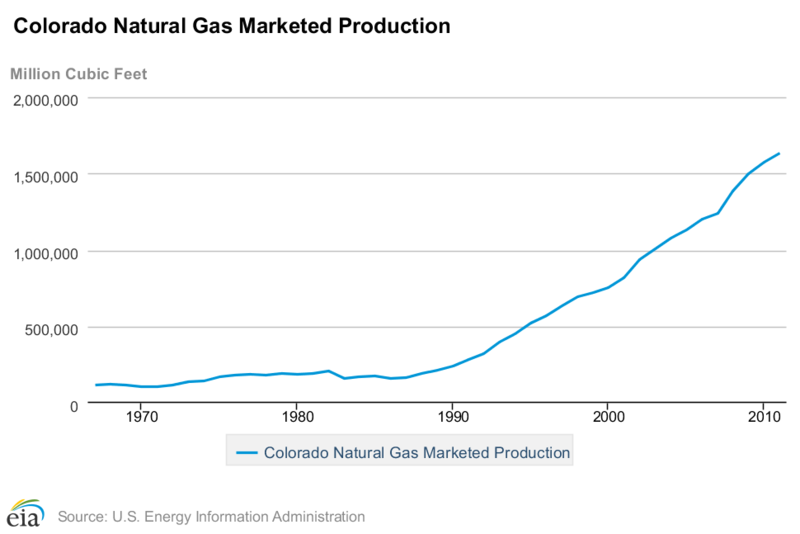 In 2011, Colorado ranked 5th in natural gas production, producing 1,637,576 million cubic feet. In 2011, Colorado ranked 11th in coal production, producing 26,890 thousand short tons. In May 2013, it ranked 28th in electricity production, producing 4,260 thousand megawatt hours of electricity. 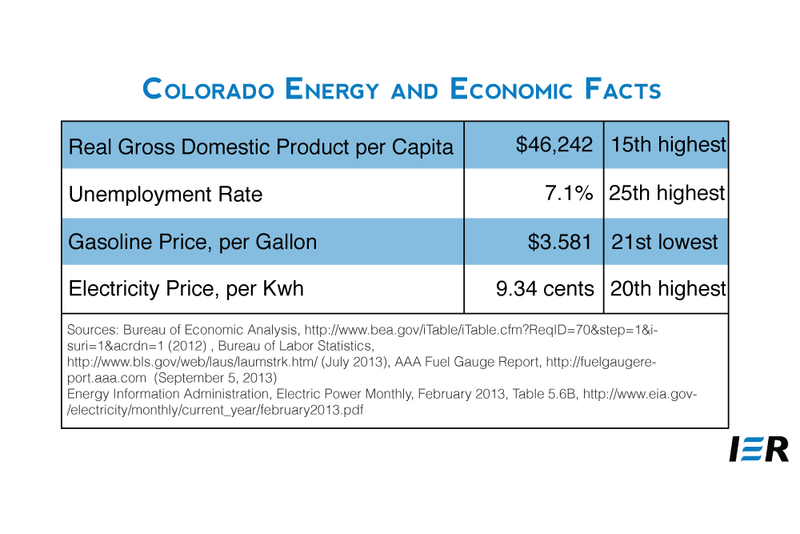 In 2012, Colorado had the 20h highest average electricity retail price in the United States. 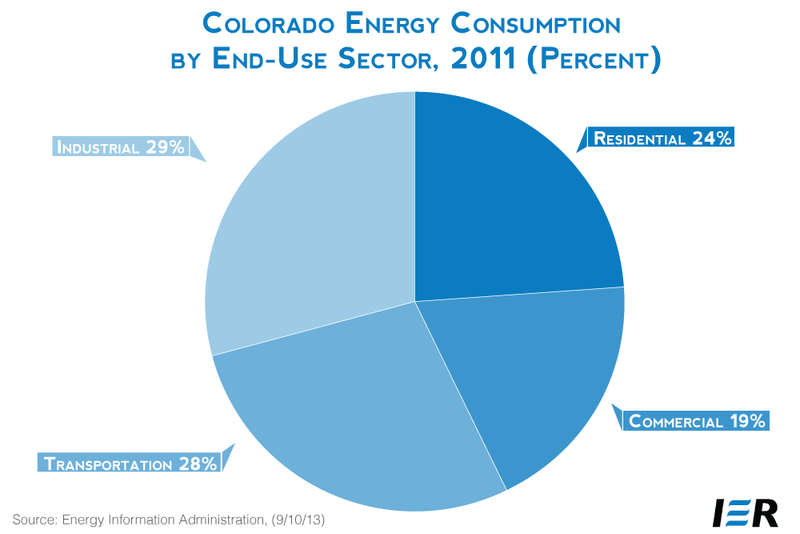 In 2011, Colorado ranked the 18th lowest in total energy consumed per capita, consuming 289 million Btu per person. In 2010, Colorado ranked 22nd highest in carbon dioxide emissions, emitting 96.5 million metric tons of carbon dioxide. Colorado ranks fifth in natural gas production among the 50 states, accounting for more than 6 percent of U.S. natural gas production. 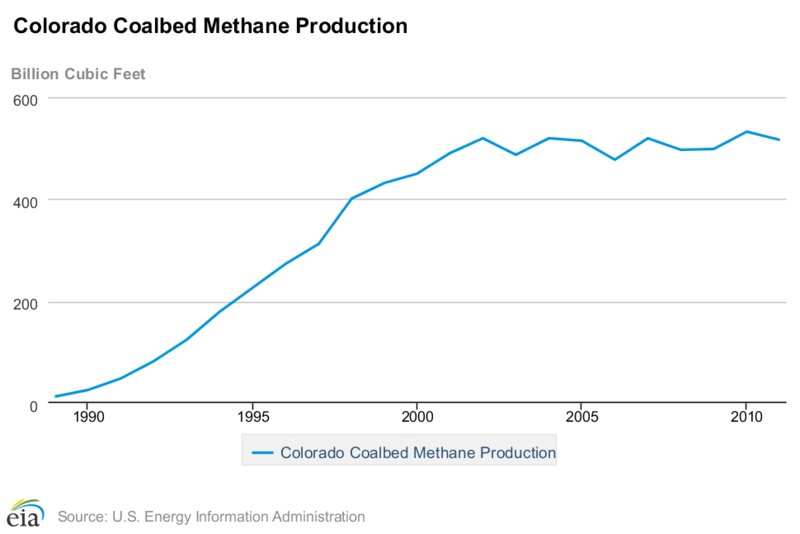 Coalbed methane (unconventional natural gas produced from coal seams) accounts for over thirty percent of Colorado’s natural gas production, and almost thirty percent of all coalbed methane produced in the United States. Coalbed methane production is active in the San Juan and Raton Basins, and further development is possible in northwest Colorado’s Piceance Basin, which holds the second-largest proved reserves in the Nation. Colorado uses about 40 percent of its natural gas production and transports the rest to markets in the West and Midwest. Natural gas is moved by pipeline from Colorado. The Rockies Express Pipeline is a 1,679-mile long high-speed natural gas pipeline system from the Rocky Mountains in Colorado to eastern Ohio with a capacity of 1.8 billion cubic feet per day. When it was completed in November 2009, it was the largest natural gas pipeline built in the United States in more than 20 years. 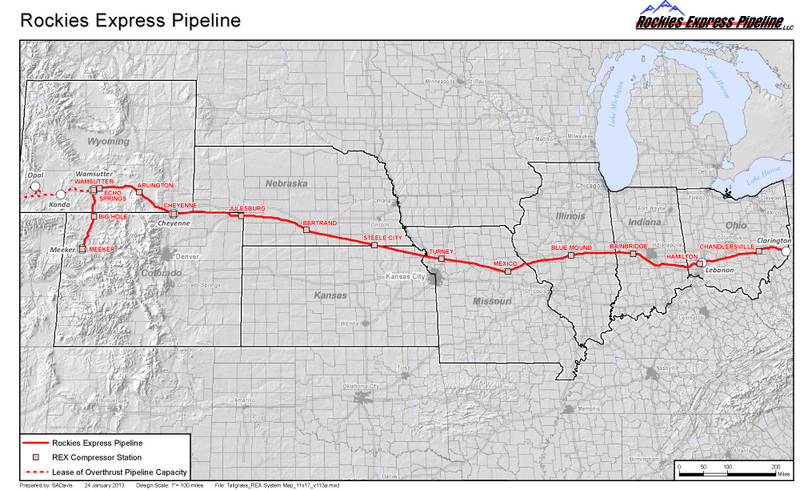 The Rockies Express Pipeline originates in the Piceance Basin and extends from Colorado to Clarington, Ohio. But, the Marcellus shale gas play in Ohio is making the need for the pipeline carrying gas there mute. The owners of the pipeline would like to reverse the flow, moving natural gas from the Marcellus and Utica formations in the other direction — westward to nearby midcontinent markets. But they are in a dispute with other shippers in the Rockies; that dispute is now before the Federal Energy Regulatory Commission. Public sentiment against hydraulic fracturing is occurring in some areas of Colorado. Currently three eastern Colorado cities — Boulder, Longmont and Fort Collins — and Boulder County have enacted moratoria or bans on hydraulic fracturing, a drilling process used to obtain oil and natural gas from shale formations. Public sentiment against hydraulic fracturing appears to be on the rise in eastern Colorado, particularly in the area of the rapidly growing Niobrara Shale play. And groups in the Front Range cities of Lafayette, Loveland and Broomfield are circulating petitions calling for anti-fracking measures to be placed on the ballot in their communities. Since 2003, natural gas generation by the electric power sector in Colorado has been increasing, rising dramatically in 2007. Electric power demand for natural gas is now second to residential natural gas demand in Colorado. Almost three-fourths of Colorado households use natural gas as their primary energy source for home heating, which is one of the highest shares in the nation. Colorado oil production accounts for about 2 percent of total U.S. oil production, ranking 9th among the states in oil production. Most production takes place in the Denver and Piceance basins. Colorado’s proven crude oil reserves account for about 2 percent of total U.S. proven oil reserves. Colorado has enormous potential in oil production through its deposits of oil shale rock, known as marlstone, which contains kerogen that can be processed and converted into refined petroleum products. The Green River Formation, a group of basins in Colorado, Wyoming, and Utah, holds the largest known oil shale deposits in the world. Colorado’s oil shale deposits, concentrated in the Piceance Basin in the western part of the State, hold about 1 trillion barrels of oil shale. While this natural resource holds tremendous promise, oil shale development is not yet commercially viable, although some pilot projects have been undertaken in the area. Most of the oil shale is located on federal lands, and while President Bush had opened some of those areas to leasing at the end of his second term, the Obama Administration had initially delayed them and eventually cancelled them. Colorado’s oil production feeds Colorado’s two refineries in Commerce City north of Denver with a capacity of 103,000 barrels per day. Several petroleum product pipelines from Wyoming, Texas, and Oklahoma help supply the Colorado market. The Denver/Boulder and Ft. Collins areas use oxygenated motor gasoline; the rest of the State uses conventional motor gasoline. The Denver metropolitan area was the first area in the nation to require the use of motor gasoline blended with ethanol to reduce carbon monoxide emissions. Colorado produces ethanol mostly from corn at four facilities in the northeastern part of the State. Colorado’s smallest ethanol production plant is co-located with the Coors brewery in Golden and uses waste beer to produce ethanol, which lowers the emissions of volatile organic compounds from the Coors brewery significantly. Colorado produces coal from both underground and surface mines, primarily in its western basins, ranking eleventh among the states in coal production in 2011. Coal is shipped into and out of the state by rail. Colorado uses about one-fourth of its coal production and supplies other states with the remainder. Colorado also imports some of its coal, primarily from Wyoming. Coal- and natural gas-fired power plants dominate electricity generation in Colorado, together producing almost 85 percent of the electricity in the state. Coal-fired plants account for about 65 percent of the state’s generation and natural gas-fired plants account for 20 percent. Wind power and hydroelectric facilities account for most of the State’s renewable electricity generation with wind power generating 11 percent of the state’s electricity and hydroelectric power generating 4 percent of its electricity. Colorado’s renewable portfolio standard requires large investor-owned utilities to produce 30 percent of their energy from renewable sources by 2020. Since 2007, when the first phase of the renewable portfolio standard was implemented, average retail electricity prices in Colorado have increased by over 20 percent, almost twice as fast as inflation, according to data from the Energy Information Administration. At one time, Colorado had one of the lowest electricity rates in the Rocky Mountain West. But, now it has the second highest electricity rate and the highest of all its neighboring states. Colorado currently has no nuclear plants. The Fort Saint Vrain Generating Station was originally built as a nuclear plant and operated as such between 1979 and 1989, but was decommissioned and converted to a natural gas powered electric generating facility, which began operation in 1996. It is located near the town of Platteville in northern Colorado and has a capacity of just under 1000 megawatts. Nineteen percent of Colorado households use electricity as their main energy source for home heating. Below are some facts about Colorado’s regulatory environment that are likely to affect the cost of energy or the cost of using energy. Although affordable energy is a vital component of a healthy economy, regulations frequently increase energy costs. Colorado does not provide a cap on greenhouse gas emissions. But, Colorado is an observer of the Western Climate Initiative (WCI), a regional agreement among some American governors and Canadian premiers to target greenhouse gas reductions. The central component of this agreement is the eventual enactment of a cap-and-trade scheme to reduce greenhouse gas emissions 15 percent below 2005 levels by 2020. As an observer of the WCI, Colorado would not be bound to agreements made by WCI members. In 2011, many of the states left the WCI leaving only California and the Canadian provinces British Columbia, Manitoba, Ontario, and Quebec as full members. 30% of its retail electricity sales in Colorado for the year 2020 and each following year. 3% of its retail electricity sales in 2020 and each following year. Similarly, municipal utilities serving customers of over 40,000 must provide 10 percent of their retail electricity[DK1] sales from renewables by 2020; electric cooperatives serving fewer than 100,000 meters must provide 10 percent of their retail electricity sales from renewables by 2020; and electric cooperatives serving 100,000 or more meters must provide 20 percent of their retail electricity sales from renewables by 2020. Cooperatives must also meet specific standards for distributed generation—0.75 percent of their retail sales must come from distributed generation in 2020 for the smaller cooperatives, and 1 percent of retail sales must come from distributed generation in 2020 for the larger cooperatives. In 2007, HB 1037 requires the investor-owned electric and natural gas utilities to adopt demand-side management (DSM) programs that provide financial incentives for their customers to purchase more efficient equipment and processes, and to engage in demand response. The state’s two investor-owned utilities have an electricity savings goal of at least 5 percent of the utility’s 2006 peak demand and electricity sales by 2018. The Colorado Public Utility Commission extended electricity sales reduction goals through 2020.The law also established minimum investment levels for gas utility demand side management programs where gas utilities annually must spend at least 0.5 percent of their revenue from the previous year. Colorado does not require gasoline to be mixed with renewable fuels. However, in the Denver/Boulder and Ft. Collins metropolitan areas, consumers must use oxygenated motor gasoline, which is a de facto requirement to blend ethanol with motor fuel. Because Colorado is a home rule state, no statewide energy code exists. Voluntary adoption of energy codes is encouraged and local jurisdictions are informed of the benefits of energy efficiency standards and providing materials and training to support code implementation, but compliance is based on the requirements of the local jurisdictions. In 2007, HB 1146 requires any county or municipality that had a building code in place to adopt a minimum energy code standard of the 2003 International Energy conservation Code (IECC) or 2006 IECC by July 1, 2008. Jurisdictions without building codes were exempt. In May 2009, HB 1149 requires builders of single family homes to offer solar as a standard feature to all prospective homebuyers. Builders are required to give the buyer the option to either have a photovoltaic system or a solar water heating system installed on their new home, or to have all the necessary wiring and/or plumbing installed so that they can easily add a solar system at a later date. In 2010, HB 1358 requires builders of new detached single-family homes to offer certain water efficient products (toilets, faucets and shower heads) if the buyer is under contract. Builders must also provide the option for the homeowner to purchase Energy Star rated dishwashers and clothes washers and various water saving landscaping devices. In July 2005, Colorado’s governor signed an Executive Order mandating that state agencies and departments evaluate business operations and implement new programs “to promote environmentally sustainable and economically efficient practices.” State buildings are encouraged to incorporate the U.S. Green Building Council’s Leadership in Energy and Environmental Design (LEED) practices for existing buildings and in new construction. State agencies and departments are also required to implement programs to better monitor and manage electricity consumption. In April 2007, Colorado’s governor signed SB 51 and two executive orders related to energy and resource conservation within state-owned buildings. Among the goals established are a target 20 percent energy reduction in state facilities by fiscal year 2011-2012, using 2005-2006 as the baseline and the purchases of Energy Star equipment when available. Colorado allows net metering. In 2009, changes were made to the state’s net metering rules for investor-owned utilities, as they apply to solar-electric systems. These changes include converting the maximum system size for solar-electric systems from two megawatts to 120 percent of the annual consumption of the site; redefining a site to include all contiguous property owned by the customer; and allowing system owners to make a one-time decision to have their annual net excess generation carried forward as a credit from month to month indefinitely, rather than being paid annually at the average hourly incremental cost for that year. For municipality and co-op customers, the system capacity limit is 25 kilowatts for non-residential customers and 10 kilowatts for residential customers. Colorado does not allow electric utilities to “decouple” revenue from the sale of electricity but does allow natural gas utilities to decouple revenue from the sale of natural gas. Decoupling allows utilities to increase their revenue by selling less electricity and natural gas. Colorado has fossil fuel resources and ranks seventh in total energy production among the states. Colorado has enormous potential in oil shale with almost 1 trillion barrels that are located mostly on federal land, which could be developed if government policies would allow those public lands to be leased. Coal and natural gas generate about 85 percent of the state’s electricity. Wind power and hydroelectric resources generate about 15 percent of its electricity. Its average retail electricity price is moderate and below the national average, but has increased by over 20 percent between 2007 when its first phase of a renewable portfolio standard went into effect, and 2012. Colorado’s renewable portfolio standard requires investor owned utilities to generate 30 percent of their electricity from renewable energy by 2020.